I have been seeing this image circulating around the social networks and it has really stuck with me. I’ve always been a supporter of local, independent businesses but when things get busy and life gets stressful sometimes it’s easier to just go to the nearest Starbucks instead of seeking out an independent, locally owned cafe. Working in downtown San Francisco you can spin in circles, walk any direction and in less than a block you will most likely find a Starbucks. I wanted something different. I wanted to get my coffee at an independently owned place but I didn’t know where to go. Until… I opened my eyes and realized there is an Italian style cafe located near my office called Palio Paninoteca. Actually I didn’t open my eyes and look around, I looked down at my iPhone where I was trying out a new program called LevelUp. 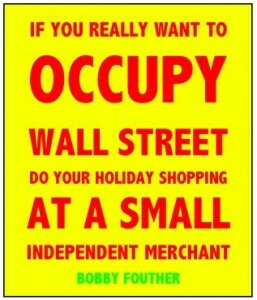 It’s a program that lets you pay with your smart phone. I’ve been wanting to try one of those programs for awhile and for some reason this one called my attention enough for me to download the app and try it. While searching the current locations accepting LevelUp I discovered this cafe just down the street. When I signed up for LevelUp I got $5 credit and noticed Palio Paninoteca offered $2 credit so I decided to head over to Palio Paninoteca to check it out and enjoy my complimentary lunch. I didn’t realize they served lunch in addition to coffee and gelato. Yes I said gelato! Palio Paninoteca’s lunch consists of soups, salads and sandwiches (paninis) prepared in advance (kind of like going to the counter at Whole Foods). So far I’ve tried 2 of their salads and they are delicious! Today I had the spinach, avocado, mango salad. Yum! While trying out my LevelUp for the first time I happened to meet the owner of the cafe. She showed me how to pay with my phone. We got to chatting and that is when I learned that Palio Paninoteca is an independent, local, woman owned business. They’re also green and serve your food in reusable ceramic dishes. Bettie Scodel is a single mom and the owner of both Palio Paninotecas. She’s also a very hard worker. She gets up at 3:30am every day to be ready to serve breakfast to the hungry masses passing through. She proudly told me of her two children in college. She’s the perfect candidate to help me keep up with my Miss Representation pledge of featuring women doing cool things around the Bay Area. Two thumbs up to Palio Paninoteca and to LevelUp. I had a great experience with both. I’m looking forward to enjoying many more coffee and meals using my LevelUp at Palio Paninoteca. If you find yourself in downtown San Francisco around breakfast or lunch time give this place a try. Thanks for spreading the word. It’s good to know about the choices we have, and what we can do to actually ensure that we have these kinds of choices. I am going to check this place out the next time I’m in the area (which is likely to be soon, the way I have been heading to the city lately). Palio is a great place for lunch and now it’s even better knowing her story! Now I’m off to check out Level Up. Isn’t it amazing how learning someone’s story makes a difference? I’m going to make more of an effort to get know people’s stories. It just changes the whole experience for me to know I am supporting a single mom who is putting her 2 kids through college rather than supporting some CEO’s giant checkbook. 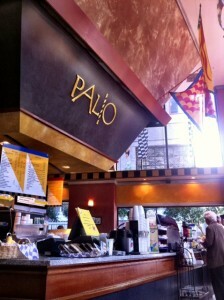 Working at UCSF for five years, Palio was pretty much the go-to place for a good lunch. Freshly prepared Italian style specialties, creative sandwiches or pannini, and even a few gluten-free items for those of us who are little finicky about what we eat. Plus great espresso, Italian sodas and – of course – gelato. Wow Doug if you say it’s good then that means it really is good!